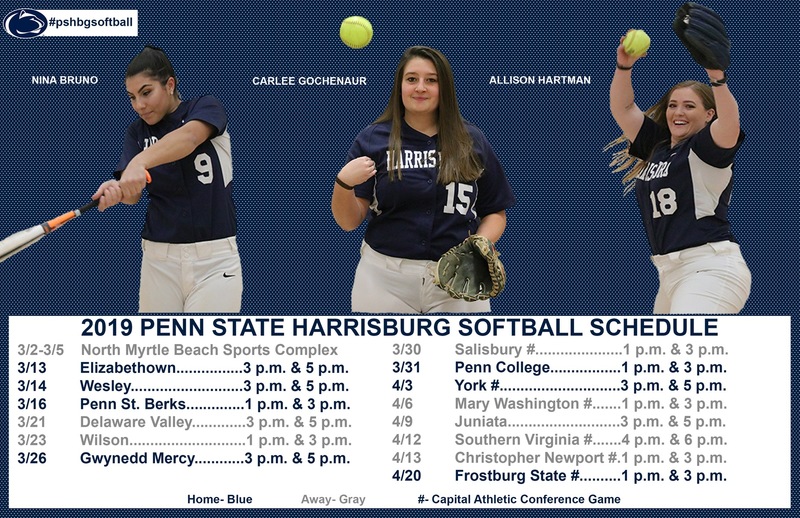 The Penn State Harrisburg Softball team return to the diamond where they faced Penn State Berks while battling strong wind gusts and cold temperatures. Harrisburg got off to a slow start, allowing Berks to score four runs in the first inning. The Blue & White would immediately start chipping into the deficit. The Lions first three batters, Katie Humphrey, Sarah Coolbaugh, and Maddie Krantz, all worked walks loading the bases. Allison Hartman hit a sharp ground ball to the short stop, driving in a run. Both starting pitchers settled in after the first inning, with Hartman, Harrisburg's starter, keeping Berks scoreless throughout the next five innings. Delaney Nevius would pull the Lions a little closer when she crushed her first collegiate homerun, a solo shot over left field fence in the fourth inning. Berks would plate a run in the top of the sixth inning to take a 5-2 lead, but the Lions offense would come alive in the bottom of the inning. Kaylee DeMatteo would start the rally with a single into left field. Carlee Gochenaur would follow with a single of her own, putting runners on base for Nevius. Nevius would continue her momentum, driving a double in the left center gap and scoring both runners. After a pitching change, Nina Bruno would give Harrisburg its first lead of the game, when she crushed a two-run homerun to left field. Holding a 6-5 advantage, the Lions looked to close out the game in the seventh inning. With one out and a runner on first base, Heather Rissell, Berks starting center fielder, lifted a ball into the outfield but Humphrey ran down the fly ball and fired to first base, picking off the base runner and securing the victory. The Lions once again fell in an early hole, allowing a run in the top of the first inning. Sarah Coolbaugh would try to get the Lions offense going in the bottom of the opening frame with a single to right field, but she would not be able to advance beyond second base. Both teams would be held scoreless in the second inning, but a solo homerun from Berks Hunter Hart sparked a three run rally, forcing the Lions starter Allison Hartman from in the circle. Harrisburg's offense struggled to adjust to Berks left-handed pitcher Val Miller, only recording two hits the rest of the way. Delaney Nevius and Katie Humphrey would collect those hits in the fifth and sixth innings, but were unable to spark a rally. Berks would score five runs, only three earned, off relief pitcher Kaylee Simon, capitalize on a pair of Lions errors to put the game out of reach. - Kaylee Simon came on in relief, pitching three innings, allowing five runs on eight hits. The Lions will return to the diamond on Wednesday March 20, when they host Lancaster Bible at 3:00 p.m. and 5:00 p.m.